Viva La Vida, translates to ‘Live The Life’, is sufficiently enough to sum up what the Spaniards do best in life. With that said a recent dining promotion themed Viva La Vida at Sentidos Gastrobar and Dining is the perfect way to Live The Life with a Spanish wine and dine gastronomical experience. 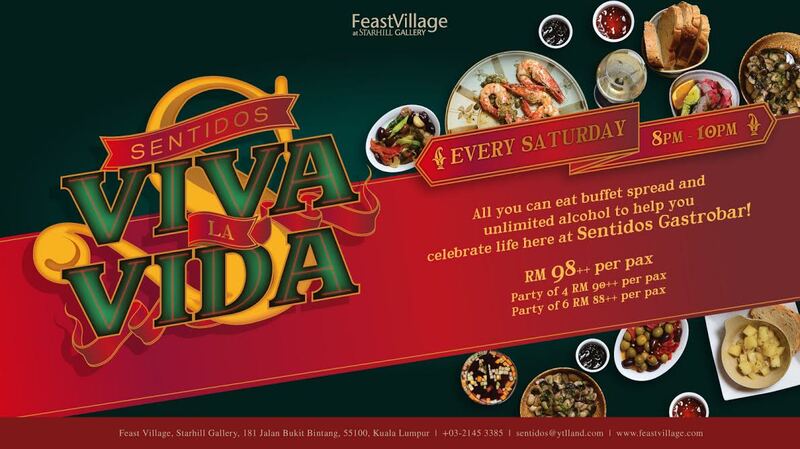 Viva La Vida is available every Saturday from now till end of this year from 8pm to 10pm. Sentidos Gastrobar and Dining has been serving up luscious Spanish cuisine for years and has also garnered awards for their sumptuous tapas. The restaurant oozes with a Spanish charm the moment one steps in from its bright orange walls to its yellow lightings and pillars with carved murals. A long beautiful curvy bar flows on one side while casual seating is placed on the other side. There are more formal dining seats inside the restaurant. The gastrobar is great for hangouts and is comfortable and easy-going at first sight. We were here for the All-You-Can-Eat Spanish buffet tapas and unlimited alcohol. Priced at RM98++ per pax, the Viva La Vida promotion is perfect for any party of any size to chill out and enjoy a hearty meal of Spanish delights from Paella to Tapas, Salads, Bruschetta and lots of giggle juices. The best part is the more people you dine with at Sentidos for this promotion, the cheaper the price is for each person. Sentidos is helmed by Chef Kok Yew Nin and team. Despite his young age, Chef Kok brings with him a very delicious repertoire of Spanish dishes that is truly authentic and scrumptious. The buffet comes with unlimited free flow of a selection of alcohol such as House White and Red Wine, Tiger Draught and cocktails of Sangria, Mojito, Caipirinha, Caipiroska and Margarita. I really enjoyed the fruity sweet Sangria with its small cubes of fruits. It paired well with all the tapas and other dishes. I also ordered the Mojito and Caipirinha which was very refreshing and thirst-quenching. Others went for their House White and also said it was a good choice of wine that paired well with Spanish cuisine. Right away, I spied a lovely setup of Salad and Antipasti bar together with a Bruschetta bar and a station for Paella. The Salad bar was filled with lots of crisp greens and dressing while platters of Stuffed Black and Green Olives and Stuffed Smoked Duck Skewers. Besides the salads, small bites of Smoked Salmon and Ceviche were also available that evening. Chips and dips took form in Nachos served with Sour Cream, Salsa and Guacamole. A Bruschetta bar filled with various house made bread and condiments allow guests to create their own Bruschetta to be filled with Pimentos Del Piquillo, Chorizo, Anchovies, Egg, Tomatoes, Cheese and various sauces. Simply tell the chef what you like and he will whip it up for you. These toasties was delicious with its crispy bread, savory or sweet fillings and oozy cheese. The highlight of the night is the Seafood Paella kept warm under heating light throughout the evening. Beautifully stuffed with loads of fresh seafood, the rice is superbly flavourful and also pretty at sight. Cooked al dente and has a lightly moist base, the Seafood Paella is wonderfully moreish and will definitely have one returning for seconds. Besides the self-service buffet, make sure to watch out for the chalkboard specials with a list of tapas available for that evening. The Deep Fried Calamari was very decent and well fried till golden delicious. We like this and order another round. Make sure to order the Grilled Cumberland Sausage if you see it on the menu. Though usually served coiled up as it is made long, ours came in tapas size. Little miniature Cumberland Sausage grilled and servied with some sautéed peppers and drizzled with mustard and mayonnaise. The sausages are beautifully moist and well-seasoned. The BBQ Honey Chicken Wing is also yummy and it comes with a side of garlicky sweet and spicy sauce. There is also a simple Paprika Chili Cheese Toast for those who enjoy simplicity. I like soups and there was Clam Chowder on the menu that night. Served in a petite cup and a slice of toasted bread, the Clam Chowder was not the thick kind but was equally beautiful in flavours with a light creamy base. Many of us raved about the Grilled Lamb Cutlet! Beautifully seasoned and spiced up, the lamb was also grilled with a lovely smoky aroma. Lusciously tender and juicy, I had to order another round of this dish. The Wagyu Beef Meatball was equally tantalizing. It came with a pool of brown gravy and was very enjoyable with the cocktails and Sangria I had. The Tapas on the chalkboard menu changes each week, so watch out for more signatures dishes from Chef Kok for the Viva La Vida promotion. Though dessert is Not included in the buffet promotion, Chef Kok and team makes a mean Tiramisu. Order this a la carte and you won’t regret it! With the coming holidays, it’s the perfect excuse to gather family and friends to hang out at Sentidos for the Viva La Vida buffet. Make sure to catch this value-for-money treat before it ends in Dec this year! Looks great! I think that I might like those here dishes. It will be really helpful if you'll add more options here. It is true that it is difficult to mark a payday loan beginning but it is also a fact that maintaining market position is more difficult and when it comes to retain business it becomes most difficult. Apart from loan size, interest rate is also decided on the type of institution from which business owner is borrowing small business Guaranteed payday loans. Foreign banks offer lower interest rate loans to small businesses than smaller banks which have high interest rate up to 7-8 percent. Another deciding aspect is business type. As US is exaggerating small business opportunities in the country, along with that strict economic measures are also being implemented to reduce speedy cash wichita ks online lending risks. It is very basic requirement that is asked by all lenders before starting lending process. So, a business must possess open bank account with good standing to climb first step to qualify for credit line. If you have any frowning history like bouncing checks and overdrawn accounts then it may upset lender and you may be disqualified. Financial institution may also analyze payday loans near me no credit check your average daily business. It is done to assure that can business maintain enough cash to repay back. If your account shows any positive projections, then lender can trust profitability of your small business.